Starting with Season 3, playing 2v2 will no longer be a Solo Ranked queue option. 2v2 Teams will still be able to queue in Ranked, but if you are playing in League without a team, the only available option will be 3v3. We have discussed the role of 2v2 and 3v3 Ranked in a previous dev blog, where we stated that there was a place for both 2v2 and 3v3. Players can more easily see what went right and what went wrong in 2v2 – it’s a mode that’s better for learning the game in. 3v3 on the other hand is the competitive mode, the mode that the game is primarily balanced for, and the one that’s the most fun to watch. There are several reasons for this change, the first of which is related to the Leaderboards added to the game during Season 1. As 2v2 and 3v3 Solo share a Leaderboard, we ended up with the unintended behavior where, in certain regions with higher populations, players were able to rank up faster in 2v2 and felt they had to continue to play 2v2 in order to remain competitive on the Leaderboards, even if they preferred to play 3v3. With the removal of Solo 2v2, the Solo Leaderboards will be a lot more fair. We also want to incentivize playing 3v3 more as the primary competitive mode of Battlerite. We already do balance primarily for 3v3, and with BPL and especially Rising Stars now available, we want to encourage people to take part and sign up and participate. Having one less queue will also allow for more balanced matches to take place. And finally, Battlerite Royale is on the horizon. With Royale being a primarily solo and duo experience, we believe that the Arena will benefit from a more clear 3v3 focus. As always, we look forward to hearing your thoughts and feedback on this change, as we have more plans in the future for ranking and matchmaking in regards to separating 2v2 and 3v3. Season 3 will also contain changes that affect Arena gameplay in a general manner. These are things we are trying out in the upcoming season and will be attentive to feedback regarding it. First and foremost, we are reducing the round timer duration in arena matches from 2:00 minutes to 1:30 minutes. For a while now most rounds played have been at the state where they are not really close to running out of time before a player is eliminated. This change should increase the likelihood of the death vortex with everyone still alive, although the majority of matches would still not do so. However, the threat of the death vortex should become a lot more noticeable than before. It will also push teams more to engage earlier, to a certain degree counteracting defensive playstyles centered heavily around denying the enemy team resources. We’re of course adding this round time duration as the default option to the private match round time selection, along with 2:30 and 3:00 minutes as well. The round time change goes hand in hand with some other changes we are doing too. With the Season 3 patch we will be changing how the healing cooldown reduction works for Supports that have their primary healing ability on M2. You may or may not be aware of it, but Blossom, Lucie, Oldur, Pearl, Sirius and Ulric currently have their cooldown on M2 reduced for each ally that is alive and within a certain range. The numbers are a bit different for everyone – for example, Blossom has a base cooldown of 3.5s on her M2. Each ally alive within range will reduce that cooldown by 1s, so with one teammate she has a 2.5s cooldown and with two teammates she has a 1.5s cooldown. In the next patch we will be changing up how this mechanic works. Instead of having the cooldown reduction being based on the number of alive allied players it will instead be based on all other alive players and the range it is based on will be global. This means that as the total number of players are reduced, the total amount of healing resources will be reduced for both teams (obviously Supports with M1 heals are exceptions). The result will be damage becoming more difficult to negate for both teams as players fall, while also eliminating the cooldown disadvantage for the team with fewer members remaining. The result will be that matches where an advantage has been established will end quicker in general, but also that disadvantaged teams will still be able to heal at an equal footing with the team in the lead. You will get the exact numbers of the cooldowns and cooldown reductions in the coming patch notes, but the rule of thumb is that all the supports will retain the same cooldown values they currently have while there are 6 players left, whereas when there’s 4 players left their cooldowns may vary slightly in comparison to the current numbers. Another change that won’t necessarily be as immediately noticeable as the first two but will definitely affect things is that we are changing how multiple Weaken effects interact with each other. Currently, if a champion were to have two 50% Weaken effects active on them at the same time, they would deal no damage at all: The effects would stack together additively to become a 100% Weaken (a 10 damage attack would be reduced to 0 damage). With the Season 3 patch we are changing it so that two 50% Weaken effects will act as a total 75% Weaken (a 10 damage attack would be reduced to 2.5 damage), where the first Weaken will reduce the value by 50%, and the second will reduce the new value by another 50%. In addition to these things we also we have a few more general changes coming your way, along with the usual balance changes to champions, in the Season 3 patch. You’ll get to know all about that in the upcoming patch notes. 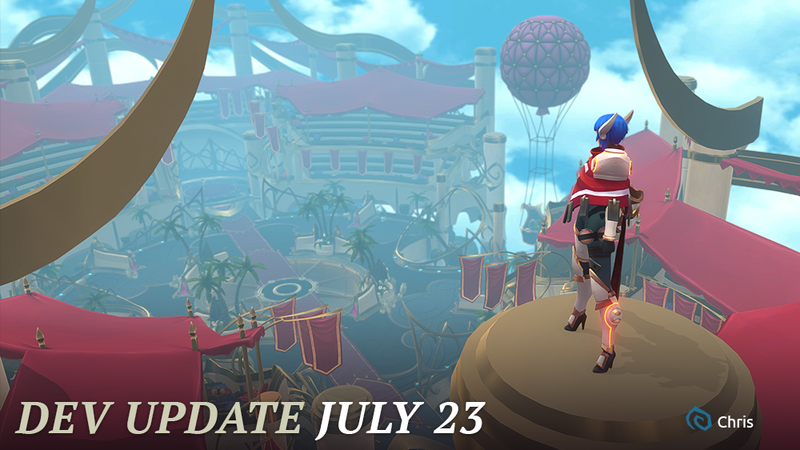 That’s about it for this Dev Update – while this didn’t include news about Battlerite: Royale and the beta signup, keep an eye out for it, because it’s coming soon!